The Zalman Ultra Quiet 15” Notebook Cooler is an effective notebook cooler for laptop users with overheating problems. It comes with two fans, and is a cost-effective way of reducing the laptop’s core temperatures. The Ultra Quiet 15” provides two additional USB hubs for all the accessories you need. Users whose GFX cards become suitable for egg frying after an hour of gaming will particularly enjoy this notebook cooler. Buyers report their GFX being cooled down for up to 25C – the exact number is, however, dependent on external conditions. The Zalman Ultra Quiet blows excess heat away with two coolers, and its aerodynamical design makes it a perfect fit even if you don’t have that much space on the desk. The design is superb: porcelain-white colouring, together with a slim body will make any laptop look great on it. 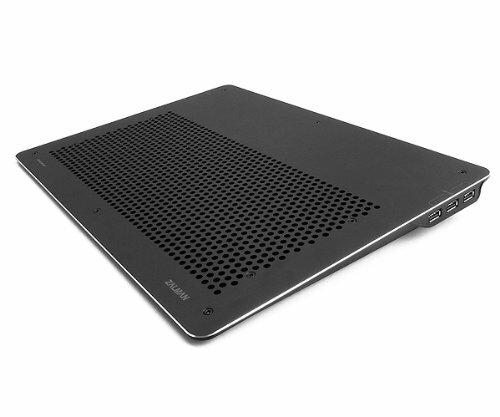 Specifically, laptops with contrasting colours – deep blue, black, dark grey, etc. – will look stunning on the Zalman Ultra Quiet Notebook Cooler. The air blowing from the fans gets to the laptop via a punctured aluminium plate. The aluminium plate also makes the cooling stand sturdier and even more pleasing to the eye. Two legs at the bottom of the stand raise the rear end about five cm up – not that much on paper, but your wrists will feel all the difference.